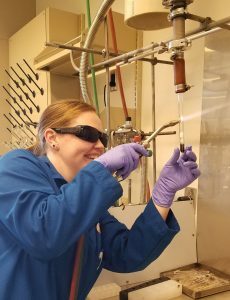 My research focuses on making new materials via solid-state synthetic methods that can be used for energy applications, such as thermoelectrics. Fundamental questions as to how atomic structure can affect a material’s ability to conduct electrons or heat will help develop more effective energy generation technologies. Thermoelectrics are devices that convert thermal energy into electricity and play a major role in NASA space missions. I am researching materials composed of tetrel (group 14) pnicitides (group 15), where properties may be tuned by altering their structures and chemical compositions.